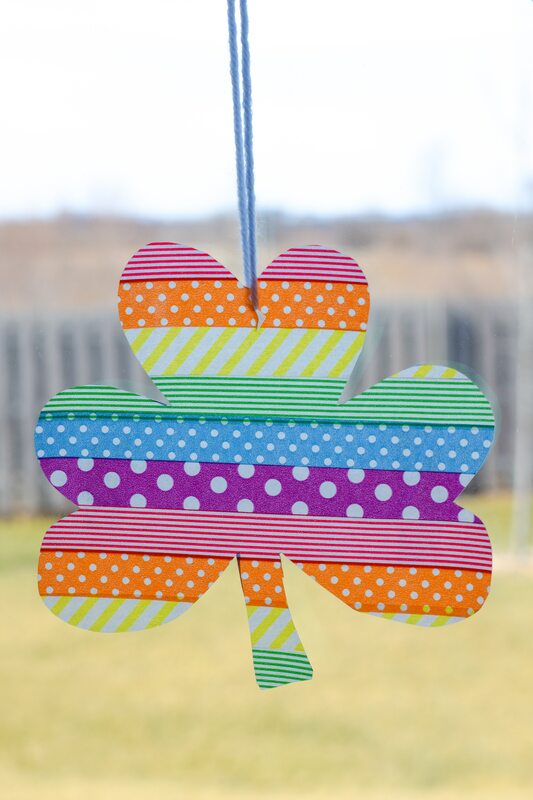 These washi tape shamrock suncatchers are a super easy craft to make with the kids for St. Patrick’s Day. And they are perfect for adding a rainbow of colors to your windows! I feel like I totally missed out on the washi tape bandwagon a few years ago when it became super popular in the crafting world. I never really used it for projects until recently and I’m a little bummed I didn’t start using it sooner – I totally get what all the hype is about now! 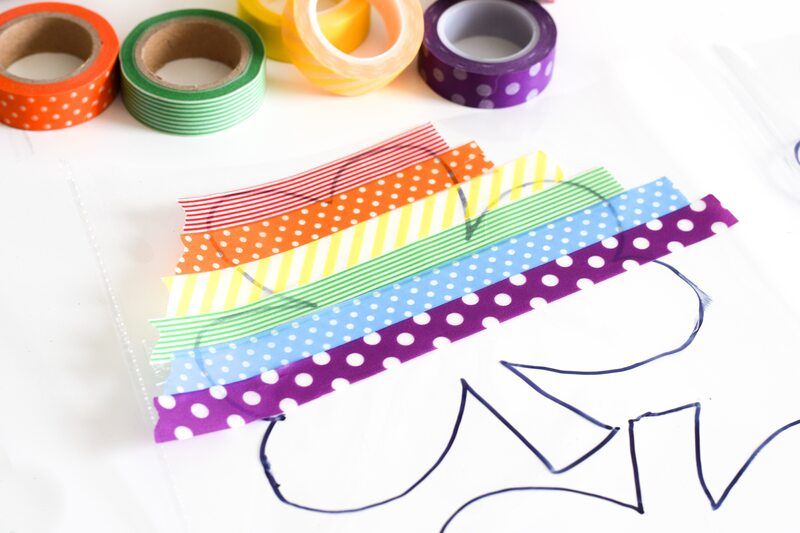 I’ve had a few rolls that I picked up at the store, but the other day I ordered a bunch from Raindrop Washi Shop, including this fun rainbow set that I knew would be perfect for St. Patrick’s Day! 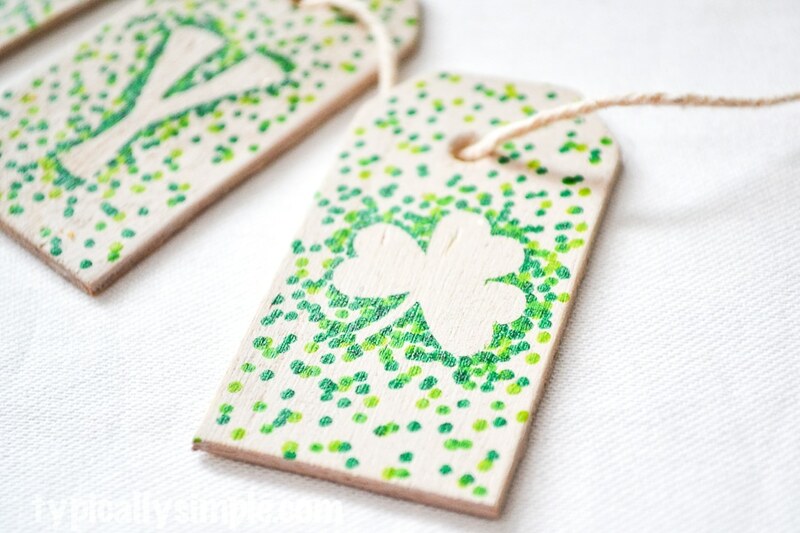 Especially after I saw a super cute shamrock craft that was shared on Raindrop Washi Shop’s Instagram feed. This craft is fun for the kids to make, but honestly, I had just as much fun! Going through my washi stash, finding the perfect colors and designs, deciding on the patterns for the shamrocks…I probably spent way too much time on this craft, but I love how it turned out! Cut the page protector across the bottom and one side so it can open flat on the table. 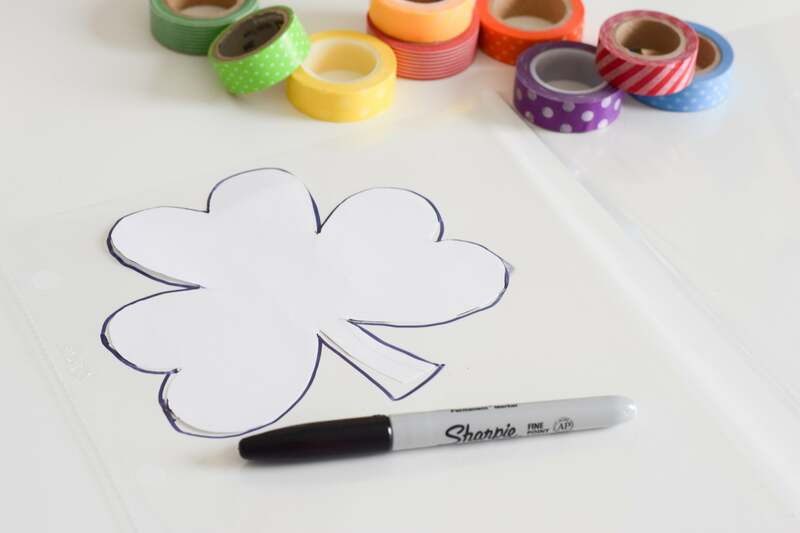 Using the shamrock template, trace the shape onto the plastic using a sharpie. 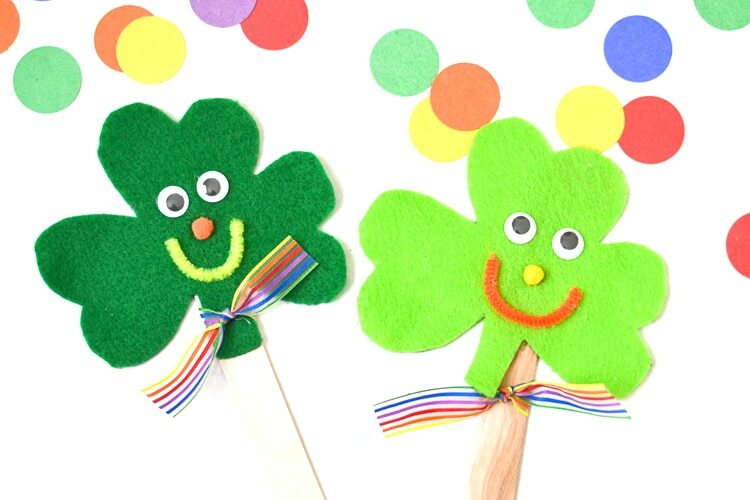 Decide on the patterns and colors of washi tape you would like to use to decorate your shamrock. I decided to make one of mine with stripes in rainbow order and then other one in St. Patrick’s Day colored stripes. Tear of a piece of washi and place it sticky side down onto the plastic. Continue until your whole shamrock shape is filled. 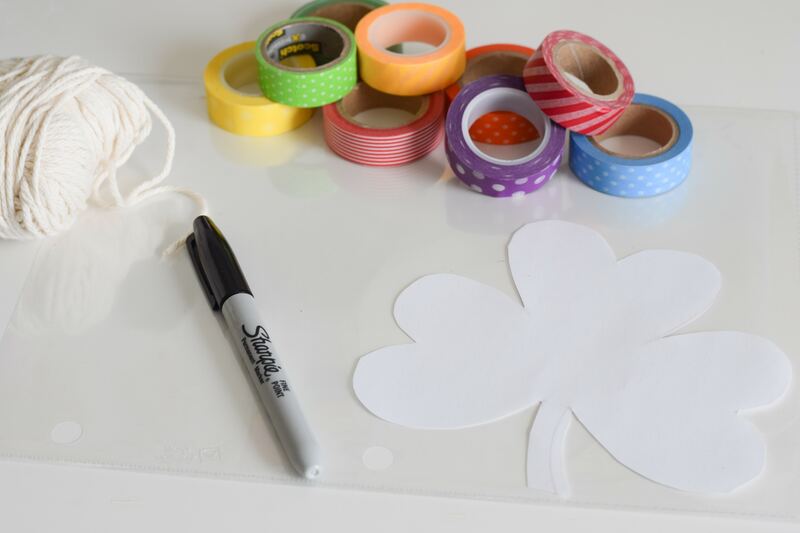 Using the marker line as a guide, cut out the shamrock shape. To hang, cut a little slit towards the top of the shamrock and thread a piece of yarn through. 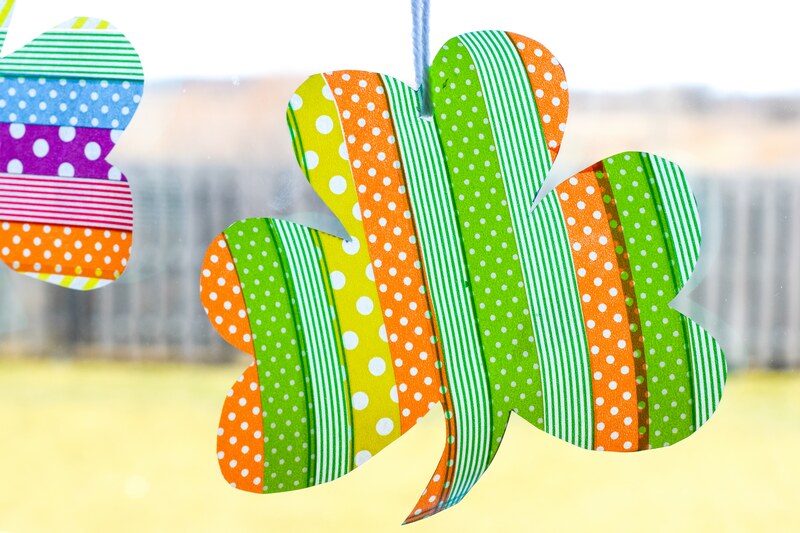 Knot the yarn and your wash tape shamrock suncatcher is ready to hang! 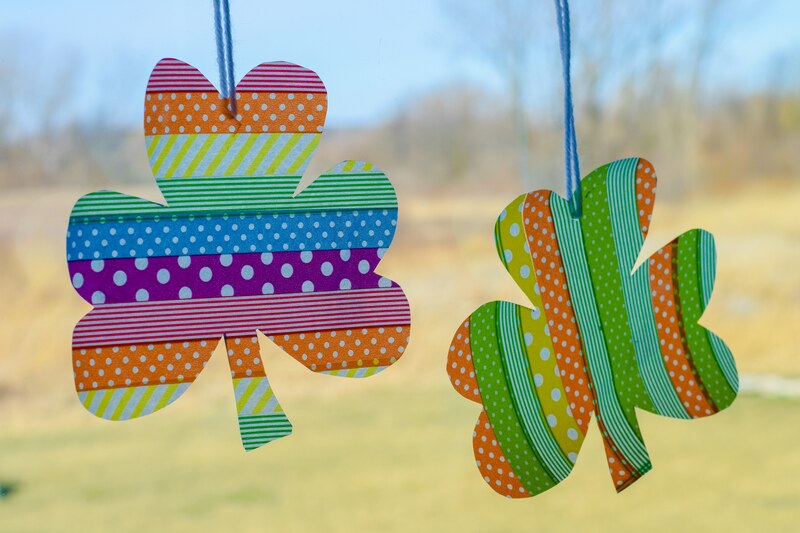 Since everything is still a bit brown outside, well actually white since it snowed here last night, it’s fun to have these bright, colorful shamrocks hanging from our windows! I’m definitely looking forward to seeing some spring flowers soon!